This guide school explores the technical skills required to safely lead people down a wilderness whitewater river. The focus will be on the skills required to boat rivers at the professional level (e.g., safely boating the river, successful camp experiences, etc.). This multi-day down river course will give you hands on experience on what it means to be an outdoor adventure leader. If you enjoy being on the water and would like to feel more comfortable and confident in your boating abilities then this is the course for you. Our boating school is a four day course that will teach you the basics of reading water, rowing and paddle boating techniques, river trip preperation, river saftey, basic rescue techniques and much more. The course is based around practical on the water training. This school takes place on the Wild & Scenic Rogue River in the beautiful state of Oregon. The majority of this four-day school will be based on an experiential learning format (e.g., learning and practicing skills through hands-on experience). However, due to the nature of some of the topics being presented within the school, there will be regular assigned readings and group discussions of those readings. All required readings will be provided to you, but your commitment to actually doing the readings is a must! Just as the quality of a guided river trip is interdependent upon all of its participants engaging within the group, so too, the quality of a student’s learning is interdependent with all the students’ active participation within the entire school. This exploration of what it means to be a professional river guide and an outdoor adventure leader is sure to be a unique offering within the realm of guide schools. No prior experience is required to participate in this guide school, but we also welcome experienced boaters who are simply interested in learning more about running rivers and have no interest in becoming a professional guide. With that noted, the school is designed to accommodate a wide variety of experience levels, and we welcome the participation from even an experienced river guide. A varying level of experience within the group of students affords opportunities for the more experienced students to assume leadership responsibility earlier in the course. Please come join us for this adventure in learning what it takes to be a professional river guide within the outdoor adventure leadership industry. Day 1: Introductions, Overview of Course, Gear Orientation, Knots and Ropes, Rigging Boats. Day trips of rafting on the Rogue – We will be primarily working on technical boating and safety skills – Trip Preparation, Safety Talks, Introduction to Technical Rope Systems, Rescue Throw Lines, Swimming Drills, Etc. Day 2-4 : Wilderness trip preparation and pack. 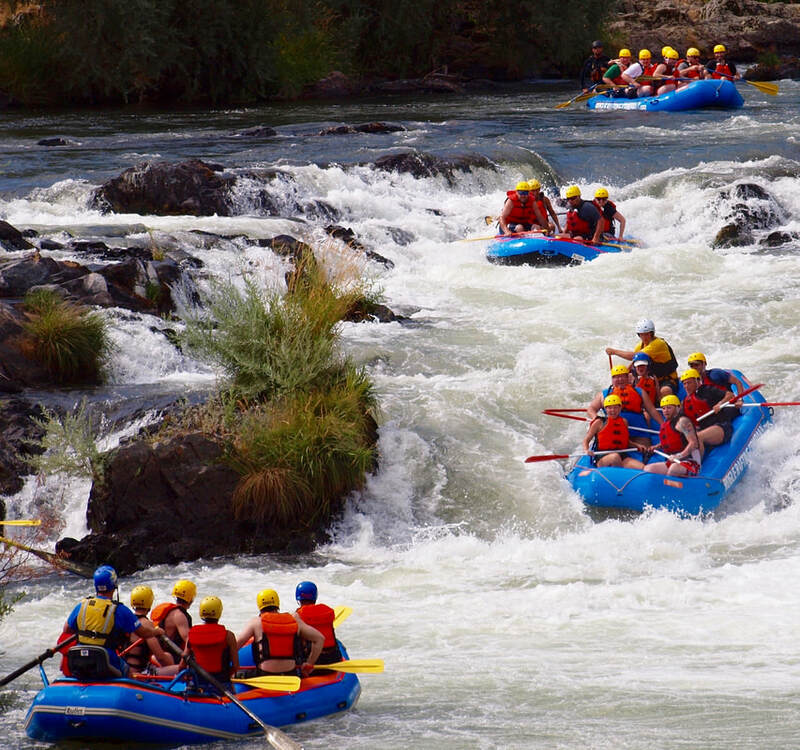 Three-day Wild & Scenic rafting trip on the Rogue River – This is where we will be applying and expanding on the first day of learning as well as getting into the more subtle aspects of what it takes to be an effective and ethical outdoor adventure leader. During the three-day rafting trip, the students will be given opportunities to practice leadership roles within the group. What to bring, & what not to bring. Clients Specifics: Sizes? Special Needs? Cross Cultural? Language Barriers? Living Proactively: Do you have a wellness plan? What’s the Water Doing? And Why? Self-Rescue – A Way of Life! Minimum Impact Ethics, The River-Side Kitchen, Food: Prep, Serving, & Clean-Up, Pack It Out! Area-Specific Knowledge – History, Geology, Wildlife, Etc. What constitutes an effective group? 7. Where do We go from here? What Now? Recommended Trainings & Continuing Education. What does it mean to be a student for life? (*Note – Part one of this school is run on a day-trip format and students are responsible for their food and lodging). We currently offering this school for April 25th - 28th 2019. If that class fills up we may add another date. Note – Part of this course is run under a special use permit for the Wild & Scenic Rogue River.